1. Avoid fixating on eye colour. 2. Make characters’ eyes a source of contrast or incongruity. 3. Use eye description to support story development. 4. 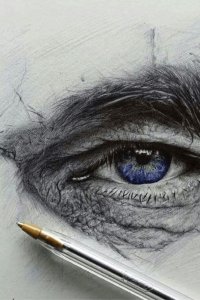 Describe the eye area rather than just eye colour. 5. Think about how eyes can communicate psychological states. 6. 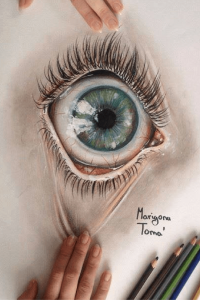 Read examples of great eye descriptions from literature. 7. Move beyond learning how to describe eyes in a story. The colour of a person’s eyes doesn’t tell us whether they are kind or cruel, an optimist or a pessimist. Often aspiring authors focus on the eyes more than anything else when describing characters. While this is a feature we notice (especially if a person has unusual, striking eyes), there are many other interesting facial features. People’s appearances are often full of strange juxtapositions and contrasts. The man with the big, ruddy face might have small, delicate hands. One way to describe characters’ eyes effectively is to use them to create contrast. For example, a character who has a nervous temperament could have an intense, penetrating stare that one wouldn’t expect, given their nervous or avoidant behaviour. One reason descriptions of novel characters’ eyes sometimes reads as cliché is because authors describe eyes apropos of nothing. ‘She smiled and looked across at him with her grey-green eyes’ reads a little awkwardly because the character’s eye colour is not particularly relevant. Drawing attention to it almost detracts from the key action here – the momentary connection between two characters. Use adjectives that describe how a character’s eyes look to support the tone and mood of a scene, drawing attention to story developments, as Dostoevsky does. Yet don’t over-rely on adjectives to create character impressions. Let actions and words speak too. To avoid clichéd eye descriptions, instead of describing colour describe the eye area. For example, if there are bags underneath a character’s eyes this conveys tiredness and/or anxiety. Eyes that are swollen, puffy or ringed with red indicate recent emotional distress. Narrowed eyes indicate hostility or suspicion. Half-closed eyes indicate drowsiness. When you get down to it, there are countless ways to describe eyes that show emotion and psychological state in addition to appearance. Make your eye descriptions do more work for your story. 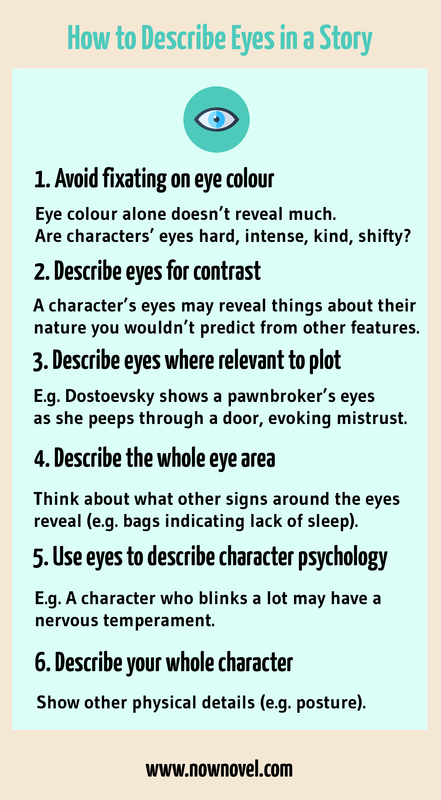 To follow on from the above point, think about how your eye descriptions create impressions about your characters’ temperaments and psychologies. For example, a character who blinks often might be a little nervous. On the other hand, a character who rolls her eyes often could be the cynical, ‘so over it right now’ teen. The important thing is not to overdo eye descriptions. If a character performs an eye movement such as rolling her eyes a few times it conveys her sarcastic nature. Yet if she does this every page, it can stale quickly. Use your discretion. It’s useful to keep a separate journal for character descriptions you love. That way, whenever you are trying to describe a character, you can page through effective descriptions and remind yourself what works. The description is simple yet effective. The adjective ‘keen’ comes before the colour ‘black’, as it should, being the more descriptive and informative of the two. ‘[His face was] whiter than a skull, with wide, livid scarlet eyes and a nose that was as flat as a snake’s with slits for nostrils’. Rowling, like Dostoevsky, places the most important, emotion-conveying descriptor first. Even though Voldemort’s eyes are ‘scarlet’, a non-standard eye colour, they are first described as ‘livid’, conveying immense anger appropriate to a villain. To truly describe characters brilliantly, describe aspects of your character that are most relevant to a given scene. For example, if a character is fleeing the scene of a crime, their eye colour is scarcely relevant here. But describing their body language (as they attempt to slip past passersby unnoticed) or breathing can heighten tension. 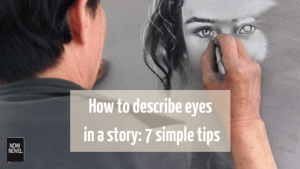 As important as it is to know how to describe eyes in a story without using cliché, it’s even more important to have rounded character description skills. Join Now Novel to create detailed character sketches using our guided prompts. Get helpful feedback on your character descriptions from your online writing community.